There was plenty of rain this weekend in the Bay Area but I was still able to enjoy being outdoors anyway. I met my friend for a fun brunch and museum outing (SFMOMA) and then met my husband for a fun dinner in Berkeley. We also got a chance to see the new movie, Anna Karenina, which was visually stunning (the jewels were TO. DIE. FOR.). With so much rain, I was more inclined to dress in a minimalist look. I definitely took advantage of wearing my Hunter boots but, as soon as the rain let up, I changed from my damp clothes into dry clothes. With simple velvet loafers (that I have been wearing to death) and my structured Maison Martin Margiela for H&M jacket (nabbed ON SALE! Even the sales associate was shocked! ), I felt comfortable but put together. How was your weekend? Did the weather keep you in or did you go out anyway? Nice steal on the jacket! Jealous you got dressed this weekend lol. It was soo stormy I don't think I even put on makeup Saturday and Sunday, ha. You look so cute. I love your jacket! Can't believe you got it on sale, what a great find! we've had BEAUTIFUL weather these last few days so i'm treasuring it! you look fab, nancy! The cut of that jacket is so awesome! I also love your pop of red in that bag. Cute!! Great look; the necklace makes the outfit. You got that jacket on sale? So great! Love the outfit,casual but chic at the same time. 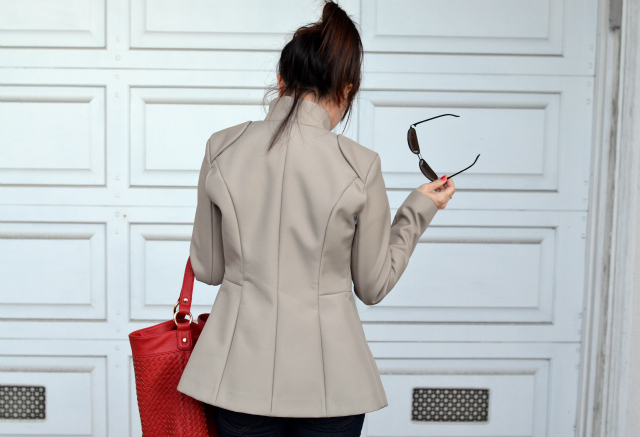 I love that structured jacket! When I went to go check out MMM at H&M almost everything was gone... probably because I didn't go exactly when they opened haha. I also like how your jeans fall just right at your ankles, perfect! I love love love that jacket. And bag. How long ago did you get it? I definitely want to see that movie! The costumes alone are gorgeous. LOVE your jacket Nancy and bag! Very cute look. super cute outfit!! and i love the huge red bag like seriously i want that bag! I'm in love with your outfits...in particular with this one! Love that jacket. Very comfortable but cool looking outfit. Glad you had a good weekend! looove that jacket! such a pretty color and shape! I love this outfit! The cut of the jacket is so perfect! ugh their h&m collection was so good and of course you would have one of the best piece from it! I LOVE this jacket on you! And indeed, i love the simplicity of this outfit and the bright spark of color. and those loafers! you look so beautiful, we love that jacket! this is a perfect weekend outfit. it's casual and chic and looks cozy! those shoes are great! Just found you on Lookbook! Love your style and your blog! all I can see is that amazing jacket and bag! so perfect and love that bag!!! xO! Those loafers look comfy but I'm afraid to get some since I think they look dangerously close to slippers. Loving the necklace and bag against all the neutrals. That jacket is amazing! How did I miss this at the MMM collection? 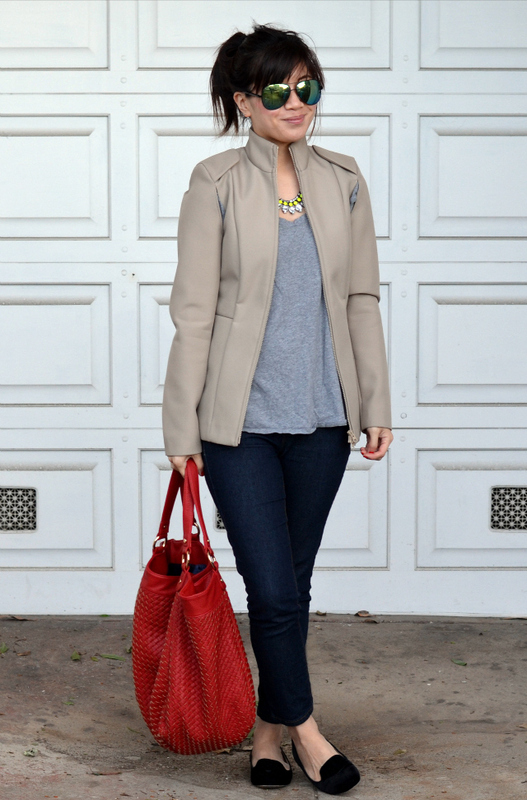 What a great find that jacket is – love the little details that jazz up the simplicity! Sorry to hear about all the rain out there of late – my husband and I are moving to SF on Wednesday! – so hopefully it will let up soon. 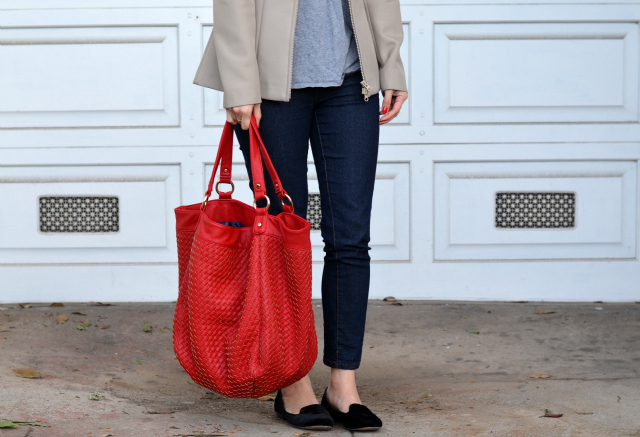 I love that textured red bag. It really brings the whole outfit together. Simple and chic. love that bag! so stylish! 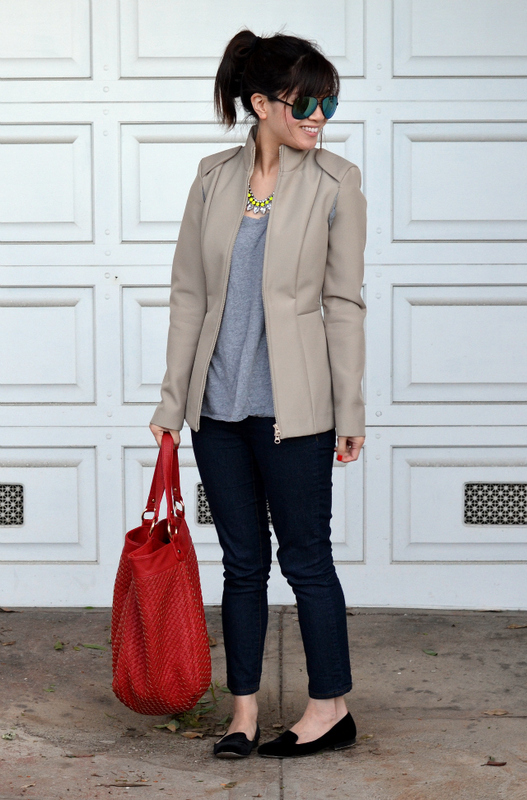 Love this outfit... your bag and necklace add perfect touches of bright color! Hope you have a great day! That coat is amazing! I looks great over the simple grey t and jeans! Love this whole look...especially your perfectly messy pony! 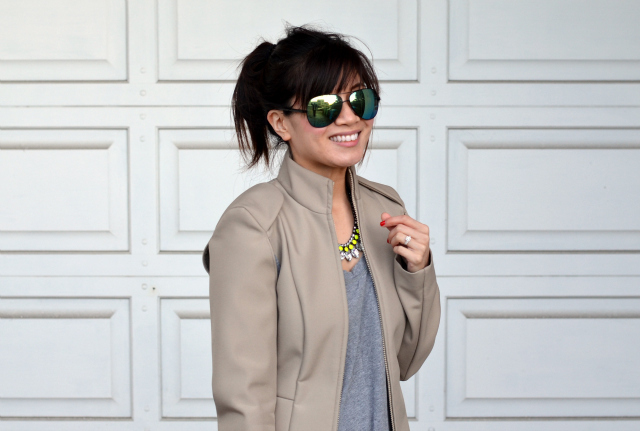 Love the necklace and jacket with your shades...great casual, classic look! I hope you are enjoying this holiday season! So glad I found your blog. Looking forward to more posts. If you get a chance, I would love for you to stop by and check out my post on some Christmas style and one of my favorite LBDs! Have a great day! That jacket is beyond fabulous on you! I can't believe I don't remember seeing it in the MMM for H&M collection. You look gorgeous with your hair up, and I LOVE your sunnies! LOVE this outfit! LOVE this look and I have the same necklace from H&M. Love how you are rocking it! Awesome iPhone Case by MargauxBonnie Giveaway Happening Now!